This is what it's like to get married in Hogwarts' Great Hall. Veterinarian Alicia Duncan had just one question for Robert Cavaco, whose military K9 was a patient at the kennel where she worked, after they met. She noticed the Deathly Hallows tattoo on his hand, and had to know: Did he think it just looked cool, or did he actually know what it meant? As it turned out, Robert was just as much of a Harry Potter fan as Alicia, and they quickly bonded over their love of The Boy Who Lived. The couple married in a civil service the following year, and on the one-year anniversary of their marriage, they threw the magical reception they had always dreamed of. 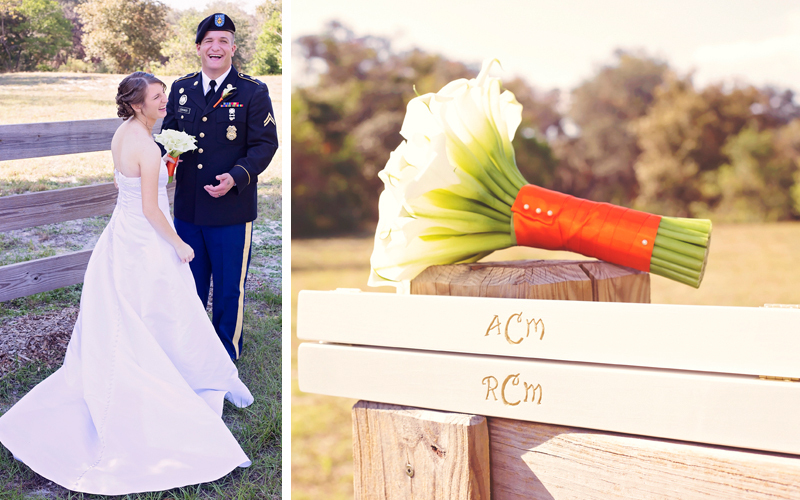 Because they were both in the military and unable to keep up with the day-to-day planning, they relied on Alicia's mother, Lisa Duncan, and their wedding planner to craft a themed wedding in Florida, where Alicia's family lives. "I asked Alicia what she wanted and she said she wanted to eat dinner at Hogwarts, and I ran with that idea," Lisa says. After a ceremony at a church in Orlando, the couple and their guests headed to a hotel near Universal Studios for the costume-party reception. An event room was transformed into Hogwarts' Great Hall, with the help of a castle-themed backdrop and 300 LED battery-operated taper candles suspended from the ceiling. Four long wooden tables were each decorated to represent a different Hogwarts house: Gryffindor, Hufflepuff, Ravenclaw, or Slytherin. Table runners, banners, and flags featured each house's official color. Groupings of moss, candles, and autumn-inspired flowers and greenery were placed down the center of each table. At each place setting, guests found Bertie Bott's Every Flavour Beans, a chocolate frog, and a miniature wand and broomstick. Two cakes acted as both works of art and dessert. The first emulated a stack of Harry Potter books. 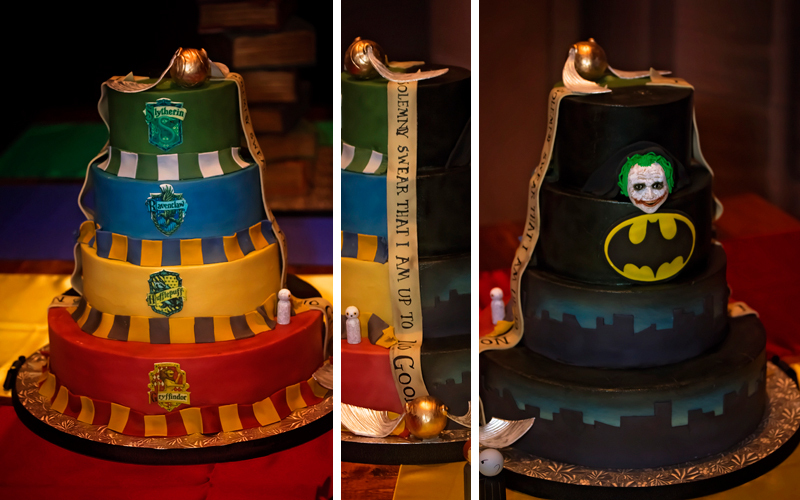 The second featured four tiers with a two-faced design: one side was Harry Potter-themed, with each tier frosted in the Hogwarts houses' colors; the other side came straight from Gotham, with Batman and Joker symbols against a nighttime cityscape. Alicia and Robert gathered their guests around as they cut into the bottom tier, which included blue cake to reveal that they were expecting a baby boy. "The moment they walked into the reception, you could see both of them trying to take it in. It was beautiful and overwhelming all at once," Lisa remembers. "Alicia came up and gave me a kiss at some point during the night and told me thank you... it was everything she had had in her head."